Since joining the team in 2014, Sam has guided hundreds of patients through a full recovery based on scientifically proven techniques. 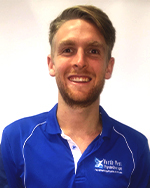 Sam is highly experienced in Sports Training and Physiotherapy, having been the Physio for the Northside Wizards QBL Men’s and Women’s teams. He’s also worked with Junior and Senior hockey teams and Primary school Basketball, Rugby and Soccer teams. This means that he has the knowledge and experience to treat any injury. In his spare time Sam enjoys playing Football at Mitchelton Football Club, Cricket and Basketball with his mates, and going to the beach.